I had absolutely no idea what's in for lunch except that we're going to have barbeque at a Japanese restaurant located somewhere along Boat Quay (I just follow Daniel! lol). Felt much gladness when it turned out to be a pleasant dining experience by the Singapore River with views of some landmark buildings. If it's lovely in the afternoon, it will be lovelier in the evening. 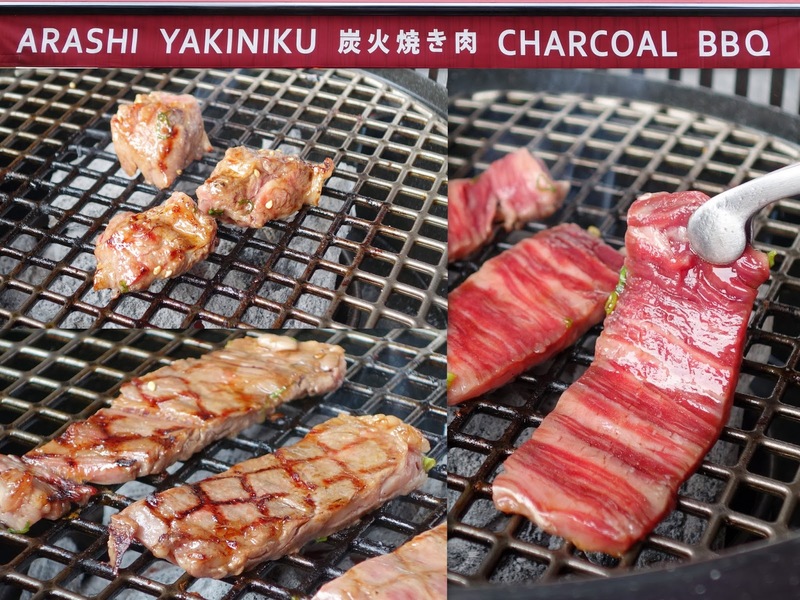 Arashi Yakiniku Charcoal Grill Restaurant certainly knows how to choose their location. We thought it would be nice to dine outdoors for a change as the weather was slight breezy that afternoon, and so that's what we did. Thanks to the merciful sun, the only thing that was barbequing in the charcoal heat were the slices of premium Wagyu beef sourced from Japan and Australia. Wagyu beef has always been synonymous with superior quality meat. The cattle are raised under extreme care and highly favorable conditions, and naturally commands a higher price compared to normal beef. Moo moo lovers would surely be delighted to know that Arashi serves up Japanese Grade A4 Ohmi Beef, which is considered to be one of Japan's top three Wagyu (the other two are Matsusaka Ushi and Kobe Beef), at reasonably affordable prices. Available cuts include Sirloin ($88.80), Ribeye (68.80), Tenderloin ($68.80), Short Rib ($48.80) and Chuck Roll ($98.80), all at 150 grams per serving. I would definitely go for the beautifully marbled Japanese Wagyu for the best combination of meat and fat, which boasts a more tender and juicy bite. Those who prefer a more intense flavor would be happy with the slightly beefier Australian Wagyu ($28.80 - $65.50). The Wagyu beef did not come marinated and will please connoisseurs who delights in the unadulterated taste, but Arashi's special Shoyu Tare is worth a try. Giving your meats a dip in this homemade seasoning before grilling gives it a subtle tastiness which complements the meat well. Just a few seconds of searing on each side is sufficient for the thinly sliced cuts, unless you have a unique appreciation for tough overcooked meat. That being said, it's easy to get distracted as conversation flows or food porning prevails, so (reminder to self): must stay focus and do delicious justice to the cow which sacrificed its life to become food for us! Besides Wagyu beef, Arashi also offers Kurobuta Pork ($12.80 - $20.80), Chicken ($9.80) and Seafood ($6.80 - $12.80) such as squid, tiger prawn and scallop to cater to the wider audience. I thought the Arashi Kaisen Salad ($15.80) could be fresher and do with more dressing, but the generous portions of salmon sashimi and prawns still provided a light respite nevertheless. The Ninniku Gohan ($2.80), Arashi's signature garlic fried rice, came freshly cooked and aromatic. Thanks to Arashi Yakiniku for their hospitality. Good: Usually worth the money! Haha. The whole dining environment looks cosy enough, and quite decor is quite authentic-like?